Ötzi the Iceman is a well-preserved natural mummy from around 3,300 BCE. Discovered in 1991, Ötzi has enthralled researchers and laymen alike. Below we will take a look at what we know about Ötzi as well as what he has been able to teach archaeologists about life in 3,300 BCE. Ötzi the Iceman was discovered in September of 1991 in the Ötztal Alps on the border between Austria and Italy. As Europe’s oldest natural mummy, Ötzi is believed to have died in 3255 BCE at the age of 45. Ötzi is also recognized as the oldest natural mummy of a European man from the copper age – referred to by archaeologists as a Chalcolithic mummy. Researchers believe that Ötzi bled to death as the result of an arrow wound found in his shoulder. Researchers have determined that Ötzi would have stood at around 5 feet 5 inches tall and weighed around 110 pounds. The mummy of Ötzi can be viewed in the South Tyrol Museum of Archaeology in Bolzano, South Tyrol in Italy, along with his belongings. It wasn’t archaeologists or paleontologists that recovered the natural mummy of Ötzi; instead it was a pair of German tourists hailing from Nuremberg. Helmut and Erika Simon were walking between mountain passes in the Ötztal Alps at 3210 m along the east ridge of the Fineilspitze when they spotted what they believed was a recently deceased mountaineer. Their belief led them to inform authorities and the following day a mountain gendarme along with the keeper of a neighboring Alpine cottage/hut returned to remove the frozen body. The remains of Ötzi were completely frozen below the torso and even with the help of ice axes and pneumatic drills they were unable to remove the body on the first day. As bad weather moved in, the men were forced to abandon their efforts at recovery. The day following this failed extraction, a number of groups of mountaineers visited the site of Ötzi’s remains, two of which happened to be famous mountaineers Hans Kammerlander and Reinhold Messner. A partial excavation of Ötzi was performed by September 22 when the remains were “semi-officially” removed from the ice. The complete excavation of Ötzi the Iceman is recorded as taking place on September 23 when Ötzi was transported to the University of Innsbruck. Researchers at the public University, located in Austria, were soon able to identify Ötzi as being primeval. As soon as the body was recovered, speculation ensued over whether the Iceman was property of Austria or Italy. In October 1991 a survey of the land found that the body was just 101 yards inside Italian land and therefore Ötzi was claimed by South Tyrol, Italy. Despite being claimed as property of Italy, Italian officials allowed researchers at Innsbruck University complete their examination of Ötzi. Since his recovery, Ötzi the Iceman has been examined thoroughly. Measurements of the remains have been taken, x-rays conducted and tissues dated. Researchers have used microscopes to research the minute details of tissues and intestinal contents have been dissected all in order to find out more about Ötzi. Researchers even turned to a later discovery of a frozen soldier from 1918 that had been frozen in Trentino, Italy to try to determine how the body was impacted by the environmental conditions. What Did Ötzi Look Like? The remains of Ötzi the Iceman had been covered in ice so soon after his death that only minimal deterioration of the body could be seen. As a result of this minimal deterioration researchers were able to discover a number of interesting facts about Ötzi’s life. Pollen and dust that was located on Ötzi’s body in combination with analysis of tooth enamel composition was able to tell researchers that Ötzi had spent most of his childhood in what is now the village of Feldthurns. Additionally, this information was able to tell researchers that later in his adult life, Ötzi had moved north into the valleys and away from the Feldthurns area. Additionally, it is believed from analysis of Ötzi’s blackened lungs tissue that he had spent much time breathing in the smoke of campfires. What Did Ötzi Eat And Where Did He Dine? Amazingly, due to the incredible conservation of Ötzi’s remains, researchers were also able to determine what Ötzi ate shortly before his death. Evidence of two meals was recovered. The first meal consisted of meat from a goat/antelope creature called a chamois. The second meal was made up of herb bread and red deer meat. In addition to these mainstays, each meal was also accompanied by fruits and roots as well as grains, more specifically einkorn wheat bran. The food recovered from Ötzi’s stomach was not only able to tell researchers what Ötzi fed on before he died, but it was also able to tell researchers where he fed. Pollen that was recovered in the chamois remnants showed that Ötzi had eaten his meal in a conifer forest of mid-altitude. Additional pollen indicated that crops that grew native to this area included legumes and wheat. The condition of pollen that was recovered from Ötzi’s remains indicates that his death took place in the springtime. Ötzi’s hair also offered clues about the time in which he lived and his potential occupation. Analysis of Ötzi’s hair found traces of arsenic and copper particles and when combined with the copper axe which was found alongside his remains, researchers have determined that he was involved in copper smelting. By taking a look at the proportions of his remains and the condition of his bones and joints, researchers have been able to determine the type of lifestyle that Ötzi led. The proportion of Ötzi’s pelvis, femur and tibia led researcher Christopher Ruff to believe that Ötzi spent a considerable amount of his time taking long walks over mountainous land. This finding led Ruff to believe that Ötzi may have been a shepherd rather than a copper smelter because this type of mobility was not seen commonly in other Europeans of the Copper Age. The state of Ötzi’s remains was able to tell researchers quite a bit about his general health. During CT scans of his body, it could be seen that multiple ribs on his right side had been cracked post-mortem as a result of lying face down or as a result of the weight of the ice on his body. Before his death however, Ötzi had suffered a number of sicknesses including whipworm (an intestinal parasite) and multiple unidentified illnesses which left Beau’s lines on one of his fingernails. The lines on one of the two fingernails recovered with his remains show that Ötzi had experienced three bouts of sickness in the six months preceding his death with the last incidence being just two months prior to his death. In addition to experiencing sickness prior to his death, Ötzi must also have been experiencing a significant degree of discomfort from the state of his teeth. Multiple cavities had deteriorated Ötzi’s overall dental health and it is believed that a diet concentrated in grains helped to contribute to this problem. Ötzi’s remains also showed evidence of degeneration that is consistent with age. Included in these injury sites are spondylosis and osteochondrosis of the lower spine and degeneration of the ankle and knee joints. Researchers also found that Ötzi showed evidence of Lyme disease. This finding makes him the earliest known human being with evidence of the disease. The idea of tattoos on Ötzi the Iceman may seem absurd but evidence suggests that Ötzi had several. These carbon tattoos could be found on both sides of the lower spine displayed as vertical lines, behind the right knee in the shape of a cruciform and numerous indistinguishable tattoos around each ankle. There is some belief that these “tattoos” are actually early evidence of acupuncture or acupressure type pain relief treatments designed to ease the pain associated with his degenerating joints. Not only does Ötzi have numerous tattoos, but he’s also inspiring tattoos. Brad Pitt even has a tattoo of him on his arm. Clothes found with Ötzi were made from woven grasses and leathers. His outfit consisted of a cloak of woven grass, a coat, leggings, a belt, a loincloth and shoes. Numerous animals were utilized to comprise the leather items of his wardrobe. These vertical strips of leather were sewn together using sinew to construct a single solid piece. Ötzi even had a bearskin cap that featured a leather strap that secured under his chin. Ötzi seemed to have specialized shoes designed for walking across snowy ground, they were wide and waterproof and constructed of a combination of bearskin soles, deerskin panels and tree bark netting. Additionally, soft grass was found inside the shoes to provide sock-like cushioning for the feet. Ötzi carried some of his tools in his leather belt which had a pouch sewn into it. At the time of his recovery, this belt pouch contained a drill, a flint, dried fungus, a bone awl and a scraper- all tools that would have been useful both in trade and in everyday life. In addition to the small tools found in his belt pouch, Ötzi was found with various other tools including a copper axe that featured a handle made from yew. Ötzi also had with him a quiver that carried fourteen arrows that had both dogwood and viburnum shafts. Two of these arrows had stabilizing fins and flint tips but had been broken; the remaining twelve arrows were not finished. Alongside these arrows inside the quiver, researchers found a tool they could not name, an antler tool that is thought to have been used to sharpen flints and a bow-string like material. A longbow was also found that was made from yew but had not been finished, it measured 72 inches long. Ötzi also carried a knife that featured a flint blade. Of all of his weapons and equipment, Ötzi’s axe is of particular importance to researchers because it is the only prehistoric axe to be discovered to date that is in complete condition. The blade of the axe, which is made from 99.7% pure copper, is believed to have been made from casting, cold forging, polishing and sharpening the copper. Not only would this incredible axe have been a useful tool for chopping and cutting but it also would have made Ötzi a status symbol in his society. Ötzi also had with him a number of other “possessions”, these included: two types of polypore mushrooms that had been threaded on to leather strings, two birch baskets, some berries and a fire starting kit that contained flint, pyrite and a number of plants. One of the mushrooms found on Ötzi is known for having antibiotic properties and was likely carried for that purpose. One thing that has had researchers obsessed since Ötzi’s finding, is his genetic makeup. A number of researchers were able to come together to sequence Ötzi’s full genome which was released in a report that was published on February 28, 2012. Autosomal DNA analysis has shown that Ötzi is most closely related to southern Europeans, more specifically the geographically isolated populations of Corsica and Sardinia. One amazing factor in the method of preservation of Ötzi’s remains is that they allowed blood cells to stay intact. These cells go down in record as being the oldest known blood cells to ever be identified. This finding is important because since these cells retained the dimensions of modern-day blood cell samples, they provide much more information about Ötzi than the shrunken cells in previous findings. A good degree of speculation existed about the cause of Ötzi’s death upon the discovery of his remains. Some believed that he had died as a result of exposure and others believed he was a victim of ritual sacrifice. Further research in to Ötzi’s remains however, found the presence of an arrowhead in his left shoulder. This finding led researchers to believe that blood loss would have caused Ötzi’s death. Additional research showed that the shaft of the arrow had been removed prior to his expiration and he had likely received a blow to the head. It is possible that this blow to the head – whether from a fall or from an opponent – caused Ötzi’s death. Regardless of the theory though, most are likely to agree that Ötzi’s death was not a solitary one, as recorded in his awkward death pose as he lay face down with his left arm across his chest. This pose seems to indicate that Ötzi had been flipped on to his stomach as the offending arrow was removed from his shoulder. The presence of various blood spots on his clothing indicate that he may have been traveling with tribesmen and the arrow was the result of a skirmish with a neighboring tribe. Researchers were also able to determine that Ötzi lived at least a couple of days following his injury from the presence of dried blood cells around the injury site. Unfortunately, as is often the case in the recovery of valuable artifacts, legal battles ensued following the discovery of Ötzi. According to Italian law the original discoverers of Ötzi, the Simon’s were entitled to a finder’s fee that was to be paid by the Tyrolean provincial government. The total of this fee was to amount 25% of the total value of Ötzi. Rather than this, the government offered the Simon’s compensation of 10 million lire, or around $6,500. The Simon’s turned down this offering and filed a lawsuit which eventually found in favor of the Simon’s in 2003. As a result of this finding the Simon’s requested a total amount of $300,000 USD as their finder’s fee. This request was challenged not only by the provincial government but also by two other parties who claimed that they had discovered Ötzi before the Simon’s. In 2006, after Mr. Simon’s death, the courts confirmed that the Simon’s were the discoverers of Ötzi and that they were entitled to their requested fee. The provincial government claimed that it would pay only €50,000 to Mrs. Simon as a result of the costs it had incurred to preserve Ötzi and they once again appealed the case, this time taking it to the Court of Cassation (Italy’s highest court). In 2008 the news broke that Mrs. Simon and the provincial government had reached a settlement in which she would receive €150,000 as a discovery fee and she would also receive the tourist income attracted by Ötzi. Watching this documentary about Ötzi on The History Channel. What Does Ötzi The Iceman Mean For Current Civilization? 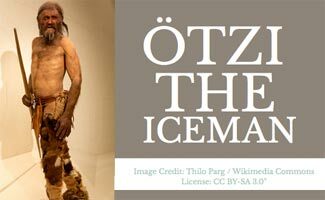 Ötzi the Iceman is a fascinating discovery and while many of us are in awe of the simple discovery of this part of history, few actually understand its implications. Ötzi makes for good entertainment for the layman, but for those involved in discovering the truth behind history and mapping out the evolution of the human race, Ötzi is much more than entertainment. The discovery of this Chalcolithic man is a key to unlocking our own past, the missing piece of a puzzle that archaeologists have been reviewing for hundreds of years. Ötzi may just be a step on the path towards understanding human history, but his intact specimen provides more information than any other natural human mummy to date. What do you find most interesting about Ötzi the Iceman? I think this website was great and had some great information for me to help my assignment. 100% recommend this to anybody researching on otzi. Philip, thanks for the kind words and happy to hear it was able to help you out! I’m trying to find about his life and how he died. Im trying to find who the scientists were who worked on him.